Poultry and livestock facilities have to be designed so that the ventilation system provides sufficient fresh air to meet the needs of the propane or natural gas appliances, the animals housed in the facility and to create a healthy atmosphere within the structure. This article, which first appeared in the Jul/Aug 2013 edition of Propane Canada magazine discussed the regulatory requirements for using unvented heaters in poultry and livestock facilities. A project that I recently completed involved the development of a position paper and proposed clauses to address the specific practice of installing and operating unvented heaters in poultry and livestock facilities. The CAN/CSA-B149.1 Natural Gas & Propane Installation Code does not specifically address the use of unvented gas heaters in poultry or livestock facilities. The use of unvented gas heaters has been common practice for most of the farmers who raise poultry or livestock. Some livestock types are very temperature sensitive especially near their time of birth. In most parts of Canada, these animals require supplemental heat during this early period and this requirement decreases as they mature. The different types of gas heaters used in barns include vented and unvented infrared tube heaters, unvented direct-fired box heaters, and unvented infrared brooder heaters. All of the heaters listed are certified to the CSA 2.20 Brooder standard. Barn ventilation is essential in keeping carbon dioxide (CO2), moisture and ammonia created by the animals within acceptable parameters. The production of carbon monoxide (CO) is also dependent on adequate ventilation to provide sufficient air for complete combustion and prevention of recycling of the products of combustion. Poultry and livestock facilities have to be designed so that the ventilation system provides sufficient fresh air to meet the needs of the propane or natural gas appliances, the animals housed in the facility and to create a healthy atmosphere within the structure. that unvented infrared heaters are interlocked with the ventilation system so that if the ventilation system reduces or shuts down the number of corresponding heaters will also shut down. Poultry or livestock facilities that use unvented gas heaters can generally meet the Code requirements for ventilation. However, the facilities do not meet the interlock requirement with the ventilation system. Unvented infrared brooder-style heater with standing pilot. It is common for infrared tube heaters to take outside air for combustion and vent their products of combustion to the interior of the barn in which they are installed. Natural and mechanical ventilation systems are utilized to control the atmosphere within the barn. The ventilation systems are not interlocked with the gas appliances as per the Code. Certain types of heaters, such as the infrared brooder heater or and the direct fired box heater with standing pilots are examples of the types of heaters that are not capable of being interlocked with the ventilation systems. Of the three different types of heaters, the infrared tube heaters or direct fired box heaters with spark ignition are the only ones capable of being interlocked to the ventilation system. Removal of gases and odors. All ventilation systems work on the principle of heat balance. This is, the heat produced by the animals must balance the heat lost through the building shell and the ventilation system to maintain a good environment for the poultry and livestock. If there is a heat deficit (more heat lost than produced by the animals) the farmer will be required to provide supplemental heat to maintain the desired barn temperature for the animals. The ventilation requirements of livestock buildings are the same for naturally or fan ventilated buildings. These requirements are determined by the heat and moisture production of the animals living and growing in the facility. If farmers do not maintain adequate ventilation, the animals will not perform as expected. Poor air quality shows up very quickly as unfit livestock with reduced feed and water intake and less weight gain. Livestock profit margins tend to be small and as such, farmers will strive to achieve maximum performance from their animals or birds from birth to market. Good ventilation is one element towards achieving top performance. Interior temperature set points which control the barn ventilation system vary depending on the type and age of the poultry or livestock housed. This variability means that the interior temperature and airflow through the facility are closely monitored and controlled. 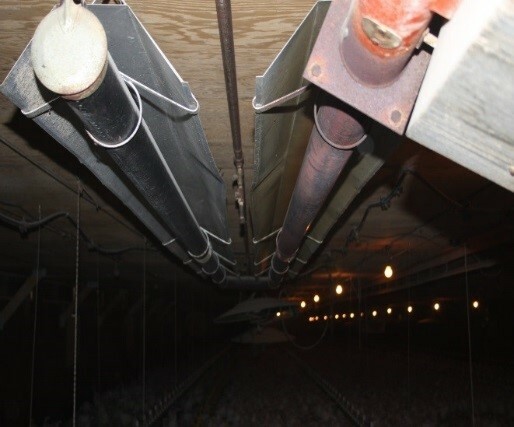 Mechanical ventilation systems use exhaust fans to remove stale, contaminated air from the barns. This creates a slight negative pressure (vacuum) inside the barn that draws fresh air into the barn through strategically placed air intakes. Air intakes are located to allow fresh air to mix with and dilute contaminants in the barn air. In barns less than 40 feet wide, the air inlets are usually located on the opposite wall to the exhaust fans. For barns wider than 40 feet, there can be inlets and exhaust fans on both sides of the building or they sometimes pull the fresh air from the attic and mount the fans on the sidewalls. Natural ventilation systems use movable side curtains with chimneys located in the center of the barn to create airflow. The wind blowing at and across the facility will force fresh air into the building by means of the side curtains. This will create a negative pressure across the top of each chimney to increase the draw out of the chimney opening. In both types of systems, where hydro is available, circulating fans are used to distribute the air evenly throughout the barn creating a uniform temperature throughout the facility. As previously stated the Code permits appliances located in a large and adequately ventilated space to discharge the combustion products directly into the space provided the maximum input of the appliances does not exceed 20Btuh/ft3 (0.2 kW/m3) of the space in which the appliance is located. The facilities examined were able to meet this requirement. The minimum ventilation rate requirement in the Code for infrared heaters calls for 300 CFM of air exchange for each 100,000 Btuh input or fraction thereof. The majority of the facilities examined were able to meet or exceed these minimum requirements 95% of the time for poultry barns and 100% for swine barns. The control of disease is paramount to the animal’s well-being and as such the poultry and livestock facilities are not readily accessible by the general public. Under normal operations, the only person accessing the facility several times daily is the barn operator whose responsibility is to monitor and adjust the interior atmosphere and temperature. As one can see, the facilities have restricted access and while the facilities may not be capable of meeting all of the Code requirements for the installation of unvented gas heaters and interlocks, the barns, must be well ventilated to ensure survival and proper growth of the animals. Controlling animal-generated water vapour and ammonia, CO2 and CO levels through ventilation rates that can be achieved throughout the growing cycle. Requiring cleaning and maintenance of the heating systems as per the manufacturer’s operating instructions at the end of each growing cycle. The B149.1 Technical Committee did not accept the proposed clauses put forward. There were several comments with respect to amending the Code to address previous installations that were installed in non-compliance with the Code and that the Code is not considered a retroactive document. 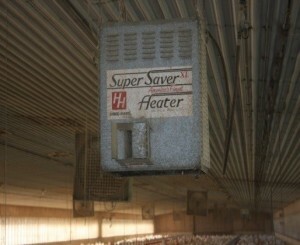 That being said there are thousands of poultry and livestock facilities with unvented non-interlocked heaters installed. The project showed there is almost always sufficient ventilation to meet the Code requirements that must be maintained to ensure the growth and survival of the animals. The barns have restricted access and we could not find any incidents where carbon monoxide was an issue. By amending the Code to specifically address the practices that have been in place for the past 50 years we are accepting a practical and proven safe method for heating and ventilating barns. 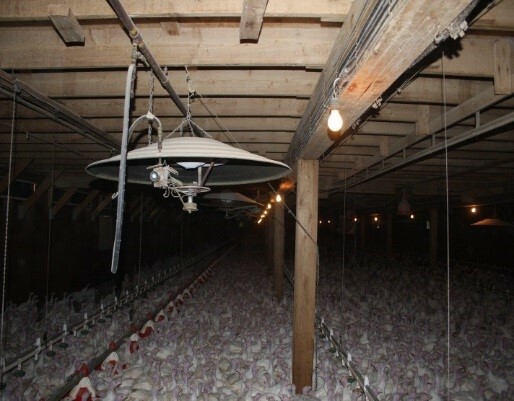 The Ontario Technical Standards & Safety Association (TSSA) have been an integral part of this project and will be amending the 2010 Code to include specific clauses put forth by the Ontario Turkey Farmers Working Group to address the installation and operation of unvented heaters in poultry and livestock facilities.